I know many of you don’t like to eat any white rice, but sometimes I think it gets a bad rap. Some of the healthiest nations in the world, including Japan, enjoy white rice at most meals. It does have a high glycemic index so if you are a diabetic I don’t recommend it. But for the rest of you, when you add fiber and protein to white rice it will significantly reduce the glycemic speed of digestion. Also, a little goes a long way. Add some sweet and sour flavors to the classic meatball recipe: try this Chinese dish to pair with some rice and a tasty tomato sauce. There are many ways to serve these saucy meatballs. Make a saucy meatball sandwich or serve traditionally with pasta. I especially like these vegan meatballs with basmati or jasmine white rice. In a large, lidded frying pan, heat 1 teaspoon of the olive oil, then add the onion. Soften for 5 minutes and remove from the pan. In a large bowl, combine the beef mince with half the cooked onion and mix well. Shape the mince mixture into approximately 20 meatballs. Using the same frying pan, heat the remaining oil and fry the meatballs in batches, until browned. Remove from the pan and set aside. Carefully wipe the pan with a kitchen towel to remove any excess liquid, then add the remaining onion along with the chopped and tomatoes. Season well, cover and simmer for 3 minutes. Remove the lid from the pan, then add the meatballs and cook for a further 10 minutes, until piping hot throughout and no pink color remains in the meatballs. Meanwhile, cook the rice following pack instructions. 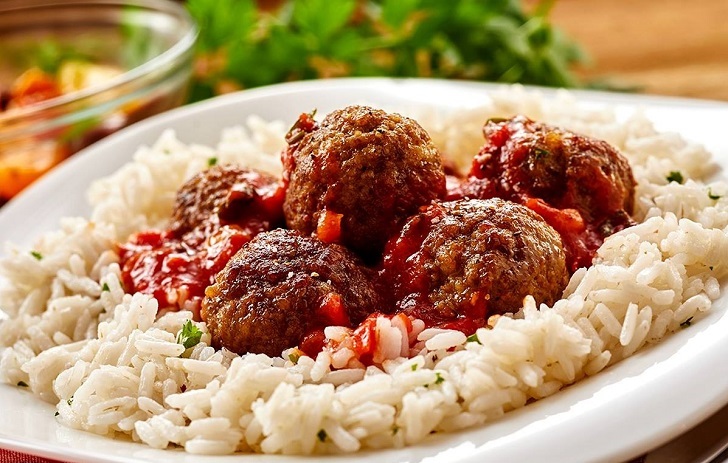 Serve the meatballs on a bed of rice. Garnish with parsley.